al-Mu'izz al-Din Allah al-Fatemi street sign. (i) A large wikala in Cairo's Gamalia district plus a cemetery/mausoleum on Imam al-Shafei Street in Cairo's Khalifa district. (ii) Outside Cairo the wakf included a large khan or bazaar known as Khan Yacoub Sabry in the historic center of the Delta town of Tanta. (iii) Also listed in the wakf were 600 feddans of the best agricultural land in the province of Gharbieh. According to related documents the Wakf (Trust; see below) was created by Amir al-Lewa Yacoub Bey Sabry exactly three years after he purchased the said Gamalia wikala from his in-law Hussein Laz Ibn Abdalla on 18 March 1845. 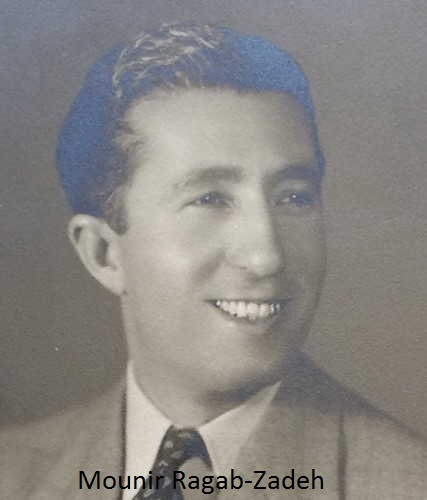 As indicated by his surname, Hussein Laz hailed from the Black Sea area known as Laz province which now straddles the Turco-Georgian border. Henceforth, the unassuming rectangular box-like wikala would be known as Rab'a Yacoub Sabry. Yacoub Sabry, an Albanian brought to Egypt by Viceroy Mohammed Ali, was superintendent of Tchifliks. This is an Ottoman-Albanian term denoting agricultural properties. In this case it probably meant the ruler's private domains. Yacoub Sabry died on 18 November 1849, willing all of his properties and assets to his three heirs: Bakir Abaza, Hussein Zohdi and Khorshed Talaat. Introduced in Egypt during the Fatimid period, wikalas (a.k.a caravansarays, khans, okells) were large buildings, usually two stories high, where merchants and traders assembled in large open-air interior halls to sell or trade their goods. Surrounding the communal area were chambers used for storing goods while the upper floor(s) functioned as a hostel for transit traders. Wekalet Yacoub Sabry was no different. Wikalet Yacoub sabry stands at a distance of about 200 meters from both al-Azhar University and the Mosque of Hussein Ibn Ali aka Sayedna al-Hussein. Located in the heart of Fatimid Cairo in what is more commonly known today as the Muski/Khan al-Khalili bazaar district, the wikala stands on al-Mu'izz al-Din Allah Street (West) and is attributed the Nos. 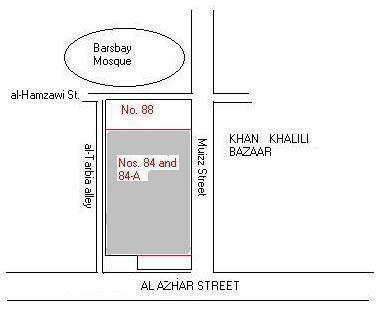 84, 84-A and 88 by the Cairo Tanzim (town planning) department. A tiny 1.5 meter wide alley separates Wikalet Yacoub Sabry from the heritage 1425 A.D. Madrasa-Khanqah of Sultan al-Ashraf Barsbay. Although the precise date of its construction is unknown, this 16th century building was either part of or simply abutted the wonderful Sultan Qansuh al-Ghouri complex made up of a mosque, a mausoleum and a madrasa or school. In 1925-6 during the re-planning of historic Cairo, the new Al-Azhar Street would forever separate Wikalet Yacoub Sabry from its alleged parent complex. Al-Mu'izz al-Din Allah Street Al-Mu'izz Street was the most renowned thoroughfare in medieval Cairo and over the centuries was subjected to name changes: al-Qassaba, Bab al-Fetouh Street, Bein al-Qasrein, al-Ghuri. The three-story wikala was allegedly rebuilt/re-designed by Khawaga Farahat al-Hinawi & Youssef al-Mawardi during the 19th century. Originally used as a depot and an inn for traveling merchants, Wikalet Yacoub Sabry included a large central courtyard surrounded by hawanit(s)--depots at ground level, and living accommodations above. With time part of the wikala was transformed into a series of ground floor shops. Before the fire destroyed some of them, the upper floors were mostly ramshackle offices and sweatshops. Whether because it was completely deformed or because it had no architectural value this wikala is not mentioned in Nicholas Warner's The Monuments of Historic Cairo (AUC Press 2005) a superb descriptive catalogue and map series of the surrounding area. Neither is the wikala mentioned in Jim Antoniou's beautifully illustrated book Historic Cairo: A Walk through the Islamic City (AUC PRESS 1998). Since the building was in such an advanced state of deterioration, the descendants of Khorshed Talaat anticipating a catastrophe, filed a petition with the Cairo governor in 1977 calling for its immediate removal on the grounds that it was a dangerous hazard for passers-by, for the wikala's tenants and for the adjacent historic mosque of Sultan al-Ashraf Barsbay. Acting upon the petition the then Cairo governor asked the dean of the Faculty of Architecture at Cairo University to appoint a three-man team for the purpose of examining the building and to submit recommendations. The team headed by professors Mohammed Zaki Hawas of Cairo University and al-Hosseini Abdel Zaher of al-Azhar University recommended that the wikala's first and second floors be removed without delay in anticipation of a secondary and more detailed examination of the building's ground floor. Despite the urgency of the matter and the safety hazards involved the Cairo governorate refused to issue the necessary eviction orders. Moreover, the motion to remove the wikala was mooted on 11 October 1979 on the basis of non-competence by a secondary court. The building, which had become even more hazardous over the years perilously survived until the fire of 7 May 2005 which destroyed part of the building. courtesy Nicholas Warner from his book 'The Monuments of Historic Cairo'. "Charles Goad, Fire Insurance Plan of Cairo, sheet 13, 1905. 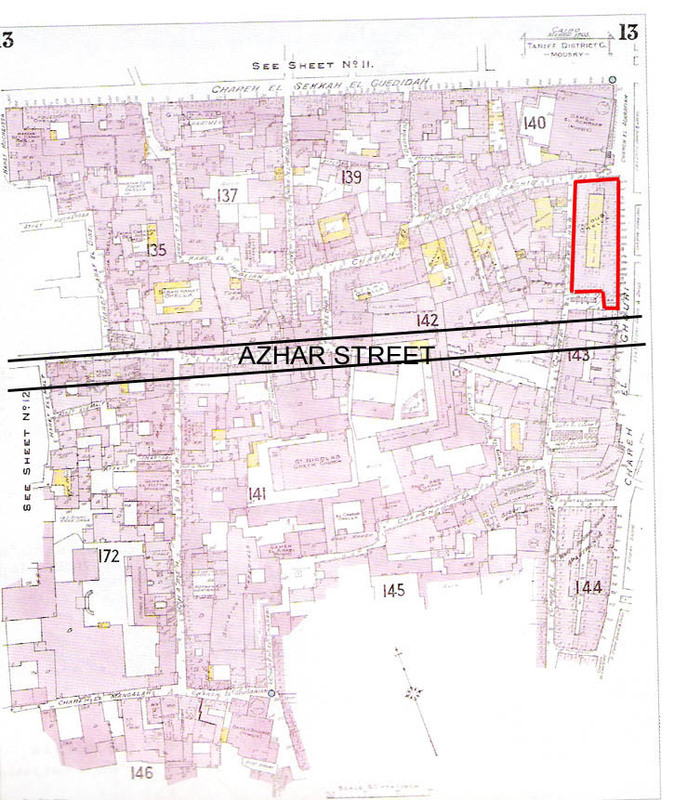 Shows area to the south and west of Mosque of al-Ashraf Barsbay before the construction of Al-Azhar Street. Wikalet Yacoub Sabry shown within red perimeter marked "Yacoub Okella". (al-Azhar Street superimposed for benefit of this study). 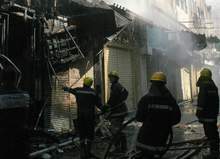 Up until a fire broke out in 2005 the wikala housed 96 registered family-run stores leased out to 52 families and individuals. In this particular case the term 'stores' stretches from a miniscule standing-room-only perfume rack to a regular 8-12 sqm depot. Many of the latter were turned into makeshift mini-factories producing items ranging from wedding candles and gold trinkets to copper utensils and glassware. A famous ground-level outlet is spice retailer Khedr al-Attar located at No. 88. 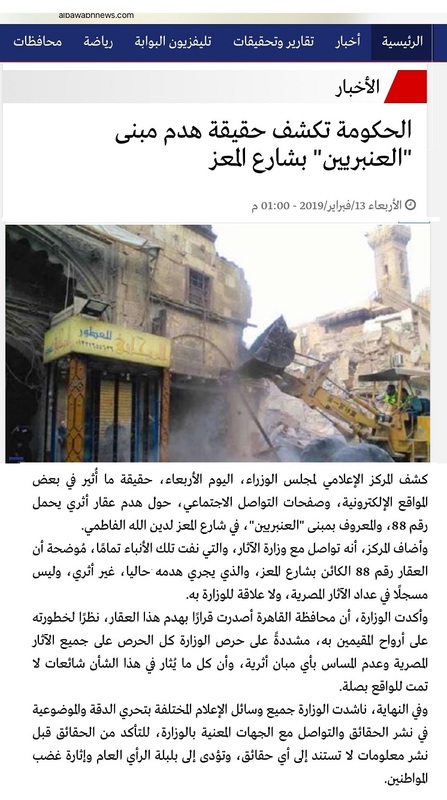 Not unlike most of the district's aging wikalas, the central courtyard of Wekalet Yacoub Sabry disappeared when adjacent shops/stores squatted or expropriated what should have been a common area. Corridors within the wikala itself were reduced to minuscule passages for the same reason. The only item that survived in its original form is the main arched doorway leading into the building. At the time it was created the Wakf was restricted to 3/4 of the wikala (today Nos. 84 & 84-A) amounting to approx. 845 sq.m. The remaining 281 sq.m (today No. 88) was left to the discretion of Yacoub Sabry's spouse Fer'ada (turkish for Bright Island) Bint Abdallah. She died on 21 September 1875. Her part of the Wakf was subsequently administered by her sister Renkili (Turkish for Lively) Hanum. Beneficiaries of the Wakf were Yacoub Sabry's heir-designates: Bekir Abaza, Hussein Zohdi and Khorshid Talaat. Terms of the Wakf stipulated that Bekir Abaza would own 41.66% (350 sq.m) the balance divided equally between Hussein Zohdi and Khorshid Talaat. In the occurrence that any one of the primary beneficiaries died interstate (childless and/or his issue became extinct), his share in the wakf reverted to the remaining primary beneficiaries and/or their descendants thereof. Since the marriage of Bekir Abaza to Khadija al-Baydaa' failed to produce an heir, upon their demise Bakir's 41.6% shares reverted to Hussein Zohdi and Khorshid Talaat. Each was now beneficiary of 50% of the Wakf. Similarly, when Hussein Zohdi's daughter Aicha from his wife Majbour Hanem died childless in 1910 with no evident heirs, her 50% of the Wakf reverted to the surviving descendants of primary Wakf beneficiary Khorshid Talaat and his by now deceased wife Jezb-Nur (Turkish for Attractive Light). Since the Wakf excluded primogeniture or gender discrimination with regards to inheritance, Aicha Zohdi's share in the Wakf was divided in three equal parts. A third to Khorshid Talaat's youngest living son Mustafa-Rouchdi (d. 1920). 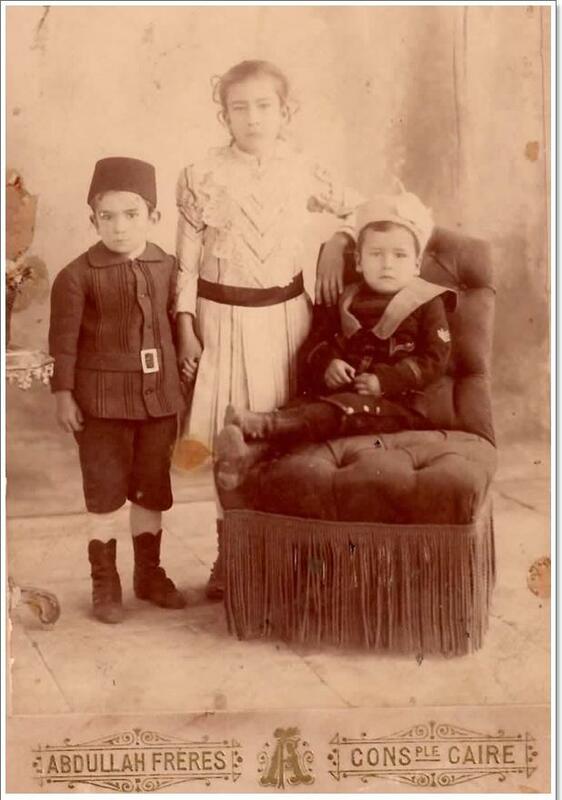 A third to the offspring of Khorshid Talaat's deceased eldest son Abdelhalim-Hilmi (d. 1906). A third to the six children of Khorshid Talaat's only daughter Fatma (wife of Amin Chamsi Pasha) who died on 12 June 1909. When Wakf properties were nullified in 1953 all such holdings were henceforth subject to Shari'a inheritance laws. This also meant Wakf assets could now be sold to third parties. It was therefore due to the application of the Shari'a inheritance law that following the death of Abdelhalim-Helmi Talaat's childless grandson in 1973, his paternal half-brother (marine officer Anwar Ali Ragab-Zadeh) was now able to inherit his share of the Yacoub Sabry Wakf, which after his death was passed on to his son Dr Hatem and his daughter Mona Skog. Anwar Ragab was the first outsider to own a part of the Wikala building. The 1/4 of the Wikala land and building (today No. 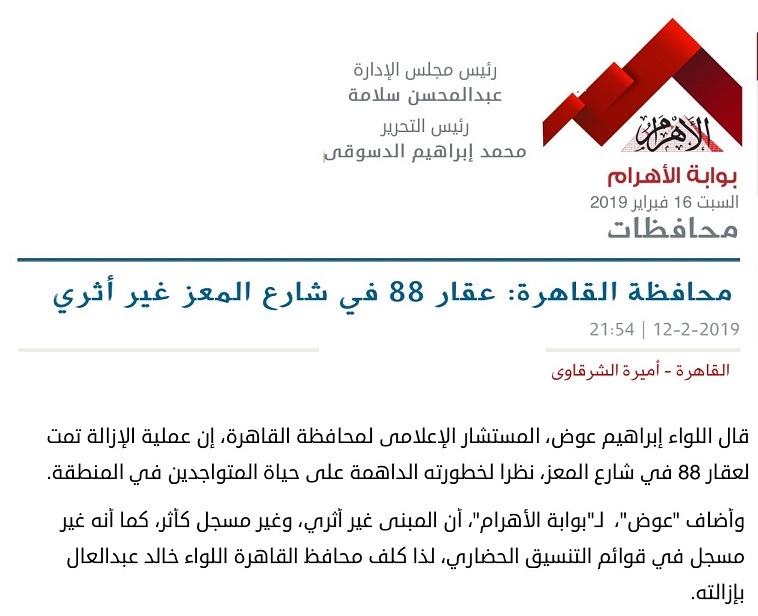 88) left by Yacoub Sabry to his wife Fer'ada's Bint Abdallah's somehow ended up Wakf Department property before it was sold by that department to a Dr. Ibrahim Abdel Khalek. The rest of the wikala land, amounting to 840 square meters, remained with Khorshi Talaat's direct descendants. As already mentioned, it was upon the death of one of his childless great-grandsons, Mounir A. Ragab-zadeh, that the latter's 279 sq. m. share in the Wikala passed on to his half-brother Anwar A. Ragab-zadeh, who was no blood relation to Khorshid Talaat. Between 1981 and the 1990s several of Khorshid Talaat�s great-grandchildren sold off their shares to outsiders, which accounts for Moheb Kadouss, a textile merchant from Mehalla, owning a share in the wikala where he was already leasing a shop. In the 1990s another heir (Kamal Saber) sold 105 sq. m to three separate tenants (35 sq.m each). Today only 379 sq.m of the wikala land remain with Khorshid Talaat's descendants who are in the process of selling the Wikala. Deed of sale (No. 2) to Hussein Laz Ibn Abdallah dated 6 Zul-qeada 1259 (28 November 1843). Deed of sale (No. 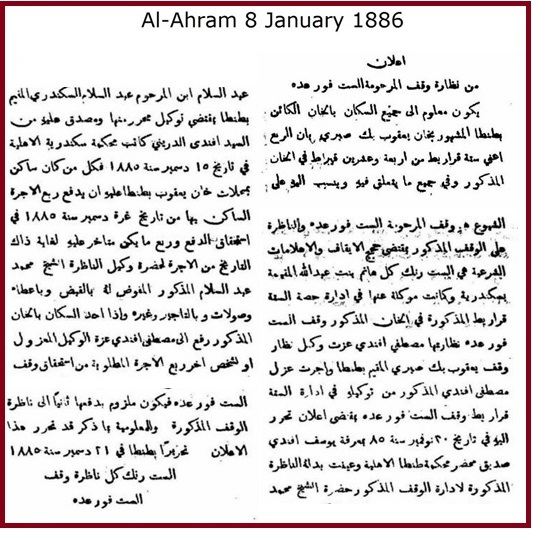 2) from Hussein Laz to Yacoub Sabry 9 Rabie al-Awal 1261 (18 March 1845). Deed of re-construction (No. 2) 10 Zul-qeada 1262 (31 October 1846). Creation of Wakf covering 3/4 assets favoring Yacoub Sabry's designated heirs 7 Jumada al-Awal 1265 (1 April 1849). Agreement to Fer'ada Bint Abdallah's Wakf 19 Jumada al-Awal 1273 (16 January 1857). Wakf of Fer'ada Bint Abdallah covering 1 /4 of assets 29 Rajab 1290 (21 September 1873). Law 180 0f 1952 calling for the dissolution of all Ahli non-pious Wakfs. 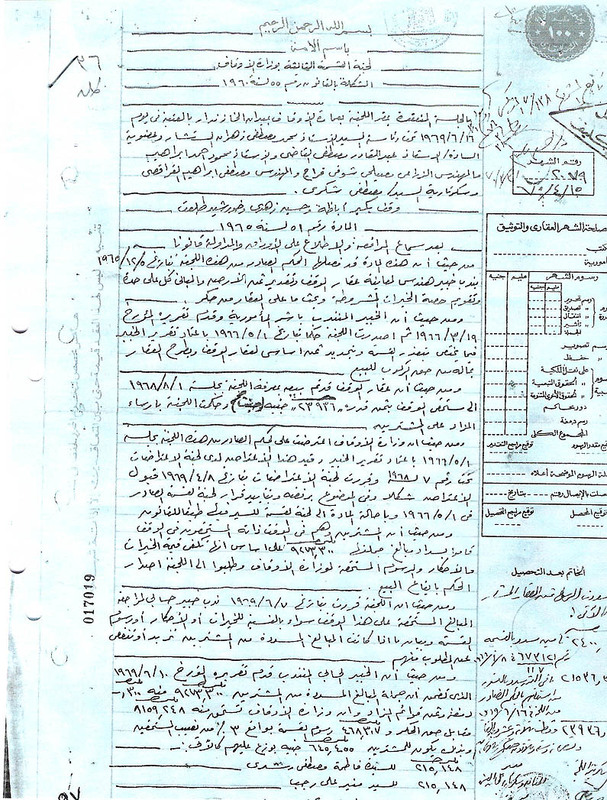 Wikala ownership defined and registered at the Cairo Notary Public Office under serial 2079 on 15 April 1970. 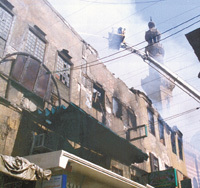 Wikala gutted by fire on 7 May 2005. Cairo Governorate decree No. 14/2005 dated 28 May 2005 calling for the removal of what remained of the burnt Wikala. Electricity Authority directive 3114 dated June 14, 2005 to cut power from Wikala. State "temporarily" expropriates the Wikala land on Thursday, 9 June 2005 as per decree 811/2005. Higher Council for Islamic and Coptic Antiquities issues resolution No. 3637 dated 11 December 2005 for setting up a committee to study the adaptive re-use of the Wikala land. Note-1: above researched by a great-great grandson of Khorshid Talaat. 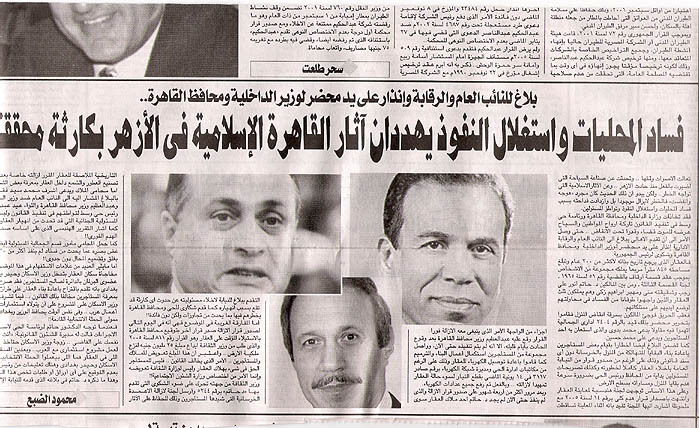 Note 2: In 2010 the heirs of Anwar Ragab together with the heirs of Fathma Khorshid-Talaat sold their shares in the Wikala to local textile merchant Tarek El-Leithi. Kamal Saber abstained from selling his share.